The Ministry of Defense Industry of Azerbaijan has expanded the sale of weapons to foreign countries, said Deputy Minister of Defense Industry Yahya Musayev at the press conference on September 24. “The sale of small arms has generally been increased. Its main customers are Asian, African and Middle Eastern countries,” Musayev said. The 3rd Azerbaijan International Defense Exhibition, ADEX-2018 will be held in Baku on September 25-27, where the country will demonstrate the armored car "Tufan" of domestic production. "The model of the Tufan armored car is already ready, and it will be shown at the exhibition. After the last tests, its production will begin," said Musayev. He noted that this exhibition will be the largest defense exhibition in the region. Also, 224 companies will be represented at the exhibition, which will occupy three pavilions and an outdoor area of Baku Expo Centre. “The opening ceremony will be attended by ministers from six countries, heads of companies and committees of 11 countries. 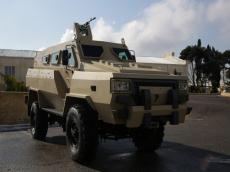 The exhibition will demonstrate more than 260 types of military products”, said the deputy minister. Azerbaijan, Belarus, France, Israel, Pakistan, Russia, Serbia, Turkey, Ukraine and other countries are participating in the ADEX 2018 exhibition with their national teams. This year, many countries have expanded the scale of its national exhibition. Thus, Turkey’s pavilion is 30 percent larger compared to 2016. The leading companies of defense sector from Bulgaria, China, Italy, Lithuania, the Netherlands and other countries are among participants. The pavilion of the Ministry of Defense Industry will be organized in the third hall of the Baku Expo Center, and this pavilion will show the most recent armaments and military equipment of local production. Here, professionals will be able to get acquainted with the new products of the country's defense industry, as well as the current and growing potentials of the Azerbaijani Armed Forces. Moreover, this year, the Azerbaijan’s scientific-technical company Vitta, the High-Tech Park of ANAS and Service Centre for Armament and Military Equipment of Air Defense will be put on display for the first time at the ADEX-2018 exhibition.